From an article published by the Sheridan Celebrates Committee. 2013 is the year that Sheridan Celebrates Military Heroes, and there has been just such a veteran participating in the parade for over 15 years. Ken Haraldsen has driven the little locomotive in the Sheridan Celebrates parade representing the Englewood Lions. But he represents far more than that. He is a true military hero whose service to this country spans more than 40 years. Enlisting in the Army Air Corps in 1942, his dream of being a pilot was dashed when he could not pass the color-blindness test. He became a mechanic and later a warden at an overseas POW camp along the Rhine River. He joined the reserves after his release from active duty in 1946. When the U.S. Air Force was formed in 1947, he became part of this organization. During his tenure in the Air Force, he became cross-trained as a medic and assisted thousands of Vietnam veterans returning to Fitzsimmons in the late 1960s. Later, he moved to the Air Force Academy working in the emergency room and making ambulance trips. His formal theological college instruction at Central Bible College in Springfield, MO, gave him the compassion and courage that was required for his long-term military service. Haraldsen proudly states, Ive saved six lives. He retired from the Air Force in December of 1982. Locally, he was employed at the Englewood Post Office for 27 years and is a 25-year member of the Englewood Lions Club. After spending a couple of summers as an engineer for the kiddie train in Belleview Park, Haraldsen thought, Wouldnt it be nice if we could have a train in the parade? So he made it happen. In 1990, he partnered with the Englewood High School shop class and constructed the little locomotive that appears each year in the Sheridan Celebrates parade. 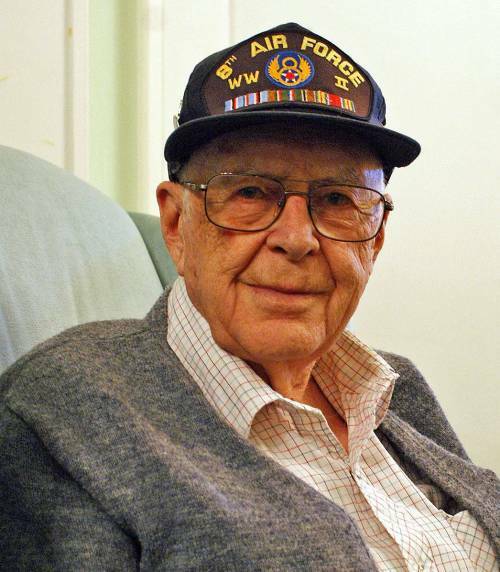 Haraldsens story will soon be elevated to star status, as he was recently interviewed for a History Channel special on World War II veterans. Dont miss your chance to meet this amazing man at this years Sheridan Celebrates parade and festival held on Saturday, September 28, 2013. The Sheridan Celebrates Committee welcomes Haraldsen as Grand Marshall. Copyright &COPY; 2013 by the Sheridan Celebrates Committee, City of Sheridan, Colorado. Edited and Republished: June 13, 2013 by the Sheridan Historical Society, Inc.
with permission from the Sheridan Celebrates Committee.